Eclipse Manager is a free Windows 8 and 8.1 app that can be seamlessly used as project manager and time tracker. The app has distinctive features that are useful in not only compiling and organizing the projects you have to handle but are also useful in keeping track of the time spent on them or overall. This project manager app lets you create folders for managing your projects. Folders can be given names and different colors; these folders can add multiple projects that you can create. To add project, you will have to give a project name, provide some information about it, choose in which folder will this project be categorized in, enable or disable Cost tracking and enable or disable Time tracking. After adding the details click on Submit to create a new project. Each project has tasks so you can add a task by clicking on Add Task button. When adding a task, you will have to provide information such as Task Name, Information, Column, Priority and Deadline. If you enable deadline then you will have to mention the date when the last date is for completing the task. 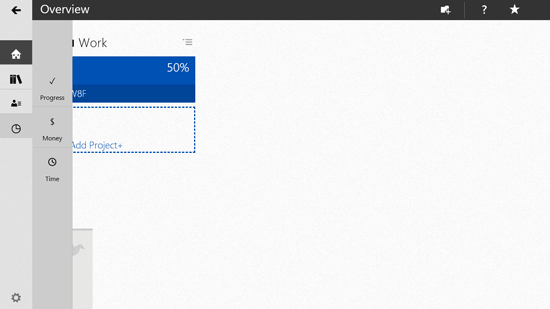 On the left side of the menu, there are buttons for overview, projects, review and trends. Overview displays the dashboard of your work; Projects display a sidebar showing the projects you have to do. 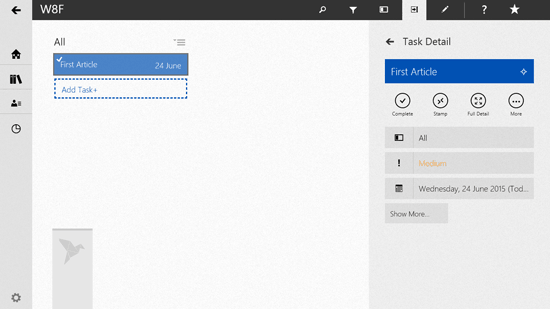 Review displays All tasks, Recent, Priority and Time line tasks. The Trends section displays progress, money and time of your tasks and projects. You can also try out the 3 free Windows 8 time tracking apps. When you are on Project page you can see panel on the top of the screen that can help you access details in the projects such as search project, filter items, insert new column, toggle detail panel, edit project, visit help page and upgrade to premium account. On right click over the project from overview, you can edit the project details. Also you can archive the project by doing the same.